SPEEDFIT Manufacturers part number: WFLX15. 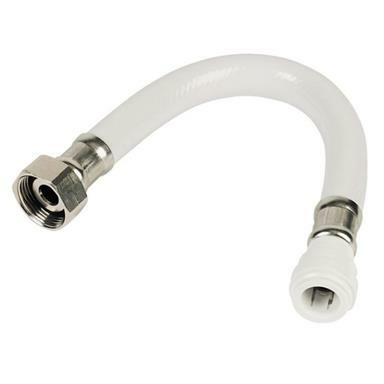 JG Speedfit 300mm PVC Flexible Tap Connector (Flexi Hose): 15mm x 1/2" BSP, Speedfit Push-Fit x Union Nut, White. - White PVC Flexi Hose for connection of plastic or copper pipe onto a male thread appliance - PVC hose material significantly reduces the possibilities of the hose ‘kinking’ and is easier to clean. - On one end the hose features a push-fit demountable connection for a supply pipe; on the other end there is a brass nut which can be tightened on to a tap or male thread. - Suitable for hot and cold water systems (NOT suitable for central heating systems). - Suitable for drinking water. - Dimensions: 15mm x 1/2"; Length 300mm. - 6 Bar @ 65°C. Please note: Price is for 1.